Years ago I had a small restaurant in southwest Colorado. It featured ethnic cuisine which was in limited supply in our town. I served Asian potstickers made with pork and a dipping sauce on the side. They were my best selling dish. 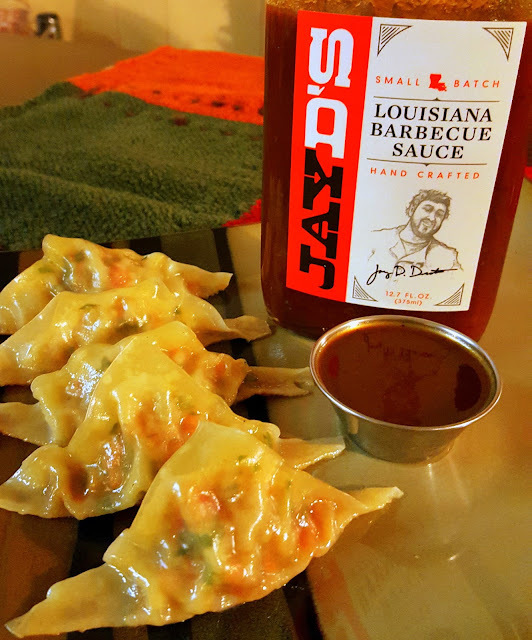 Potstickers may not be the first dish that pops into your head when you think of a barbecue-style sauce – and this became even more far-flung when I decided shrimp should be featured in the filling. This is what happens with Jay D’s sauces. They are like culinary starter fluid for the imagination. You hold this flask of imagination in your hand and before you know it… 3-2-1-GO! Have ready a small cup of water for sealing the dumplings. Finely mince the shrimp and add to a medium/small mixing bowl. Add the carrot brunoise, red pepper brunoise, cilantro, garlic paste and a pinch of salt and pepper. Add Jay D’s Louisiana Barbecue Sauce and mix thoroughly. Lay out one dumpling wrapper in a diamond pattern with one point closest to you. Wet the outer 1/2” of the entire wrapper. Using a slightly rounded tablespoon, add filling to the center of the dumpling wrapper (do not overfill). Fold the wrapper, meeting the top and bottom corners. Carefully press the sides to seal. Slightly flatten the bottom of the potsticker. Hold on a board or plate until ready to cook. Repeat with remaining wrappers and filling. Have ready about 1/3 cup of water. Heat 2 Tablespoons of vegetable oil in a small sauté pan with a tight fitting lid. Place 6 potstickers into the pan. Cook approximately 1-2 minutes, or until a crust forms on the bottom of the potstickers. With the lid of the pan in one hand and the cup of water in the other, quickly pour water into the pan and IMMEDIATELY cover with the pan lid. Reduce heat slightly and cook about 3-4 minutes, shaking the pan occasionally. Repeat with remaining potstickers and serve hot. Additional Jay D’s Louisiana Barbecue Sauce can be offered for dipping.